Clarets boss Sean Dyche was pleased with his side's resilience after beating Championship leaders Hull City 1-0 at Turf Moor. Sam Vokes' eighth goal of the season, 14 minutes from time, saw Burnley move to within a point of top spot. Burnley had the better chances in the first period, predominantly from set pieces, but Dyche's men withstood some Hull pressure after the break, before ending the game the stronger. 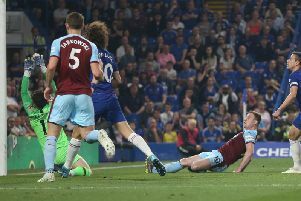 Dyche said: "I thought we played very well first half, against a very strong, experienced side, with an experienced manager. "We think it might be a tight affair. They've stayed compact on the road and broke on teams, and they did that first half. "I don't think we created a golden chance in the first half, but enough to make them nervous I would say. "The keeper had to make a couple of saves, they had to make a couple of clearances when the ball is bobbling about, we offered a real threat from set pieces, as well as general play, against a very strong defensive side, especially away from home. "They've become stronger and have a big depth of experience, and on the bench, and, of course, the manager. "Its very pleasing, for many different reasons, all the things you need to be successful and win a game were on show, and they have been for a while." He added: "I thought we controlled the feel of the game and some of the quality in the first half, but the first 20 minutes of the second half - I don't know what Brucie said to them at half-time - but they progressive, they got forward, put us under a lot more pressure, but the good resilience we've shown in many games this season was there again. "Other than the Hernandez chance, the chance of the game for both sides, I don't think Tom had too much to do, and then we got stronger in the last 15, 20 minutes, scored a good goal, didn't get a penalty that is one - I've seen it back. "We've struggled to get penalties all season and didn't get another. "The keeper catches his foot." Vokes was booked for simulation - ironically after being criticised on Match of the Day last season for not going to ground against Swansea: "We're damned if we do, and damned if we don't. "If we don't go down, last season Ruud Gullit is saying it's ridiculous they don't go down, he does go down, he doesn't get a penalty and he is caught - his foot is dragged away by the keeper, but we don't get a penalty. "Another week, you might need that decision. We didn't today, but you might another week, so we expect one to go for us at some stage." It was a big win in terms of clawing back the leaders, but for Dyche, it was just another important three points: "The fact you're playing Hull at home, and they can get that gap, of course it matters, but the league table at the end of the season doesn't give a monkey's who you've beaten, it says the points you've got are enough to do the job. I'm more interested in that. "There's more to it than that, the psychology thing, people see you've win again against someone who's just won five on the trot, manager of the month - rightly so - all of those things. "But my job is to see through all that - it leaves us three more points to the good. "Keep getting the three points, see where it takes us."